Actually I’ve done this before, but I’ve been tagged by Angela for the page 123 meme and I’m going to do it again – it’s easy. Well, I’m not going to stick completely to the rules because the nearest book, would you believe, is Ian Rankin’s A Good Hanging, which is the book that was nearest to me last time. It’s on the desk as I’ve started to write about it. So the next nearest book is one I haven’t started but have been meaning to read ever since I bought it. 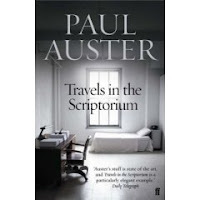 It’s Paul Auster’s Travels in the Scriptorium, a short book, but fortunately it has 130 pages. Once he got you out of the room, he was planning to kill you. I’ll have to read the book now. I didn’t tag anybody last time but now I’m tagging, that’s if they want to do it – Melody, Paula, Stephanie, Lisa and Alison. A white horse? ?I’ll just have to get reading this book to find the white horse! Absolutely I’d love to play! Be back soon! Thanks for doing this … I think the page 69 tag (see Cornflower’s blog) is more interesting than this one, although this one is fun … or the one that could be adapted from what we were taught at Middlesex where I did my MA in Writing. It was suggested to us that if, on page 100 of our books-in-progress, there was nothing to hold the reader’s attention (in our case the tutor’s attention) then we should go back to the drawing board.The habit has never quite left me and often when I’m wondering whether or not to buy a book I’ll glance at page 100 first!I feel another meme coming on … ? Thanks for tagging me. 🙂Here’s mine.